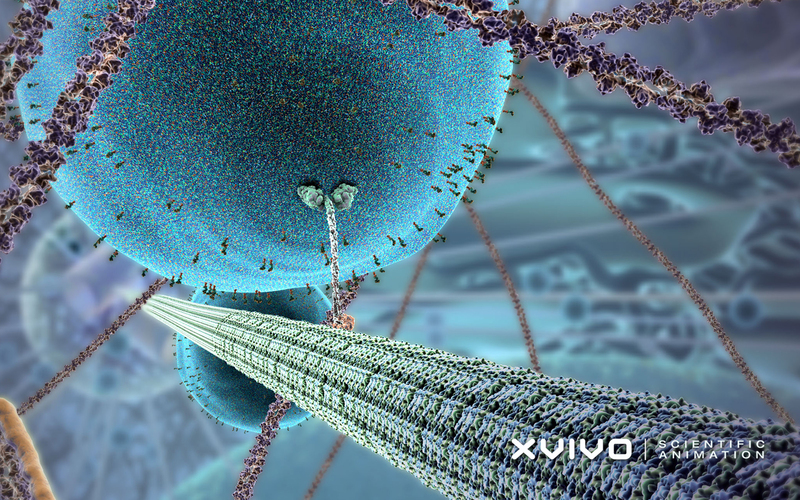 Kinesin protein walking on a microtubule. We’ve been discussing a new level of our hierarchical organization of life: cells. Everything we’ve discussed about biological molecules, polarity of water, functional groups, organic chemistry, hydrophobic, hydrophilic interactions, protein manufacture, etc., leads up to the cell. This entry was tagged Art, Chapter 4: Cell Structure and Function, Chapter 6: Cell Structure and Function, technology. Bookmark the permalink. ← Science Club post: Watson, artificial intelligence, and the future. I find it quite amazing how tiny a cell is and how complex it is. Our bodies have about 37.2 trillion cells and each one of them is the same. For example, our brain cells do not have the same function as stomach cells. Also cells have different processes and cycles happening within them. Cells are basic unit of life, they carry out out life processes. All of this shows us hoe important they are in life. This topic is very interesting to me because of how complex the cells are, besides from having 37.2 trillion cells in our body and performing the same function at the same time, what really was impresive was how the virus got into our cells and from being executed by defenses that our body has, like the immune system, it is capable of reaching the nucleus. All it takes is just one virus to enter and reproduce to build an army. But the pathway the virus has to take is very long that it would take about 24 hours for us to start feeling ill. The viruses main objective is to reach our nucleus so they can reproduce to continue to invade other cells we have in our body. One question that i had in mind is, why does the incubation period of the Chikungunya takes typically 3-7 days after the mosquito bites you? Why doesn’t it affect us between 24 to 36 hours like other viruses? Could it be related to our age or immune system? In the video you posted, we can see the life inside of the cell, how each organelle works and together with each other. I was surprised to know that a cell, that is so small we can’t see without a microscope, does so many things at once. We saw the process in which a virus enters the cell the get to the nucleus and make more cells of that virus and it is very clever how the body reacts to this and sends a message to the white blood cells so it can kill the virus. I looked up an interesting video that shows the outside part of an immune system’s white blood cell and how it kills virus and bacteria. It includes various scenarios where it does this and is very amazing. The cell is probably the most efficient machine. It can take on multiple tasks at once and be able to complete each one effectively. Evolution has come so far and to think us humans and our cells are still evolving is even more impressive. We often don’t take in consideration the beauty of our bodies and how everything is so perfectly made and works together like a symphony. I would love to learn more and more about cells and our body because it is really a never ending topic to learn about and be educated about. It’s funny how such a tiny thing is considered the most complex living thing. It’s hard to imagine it but it true. The cell can take all life processes and make them alive. The cell has a life of it own. Like us, it has stages. First we’re a baby, then a toddler, and etc. and the cell, well, we are still trying to figure out all stages. But, I think that if anyone(aside from scientists) need to talk about the cell very vaguely. The cell has a world of it’s own and we still haven’t figured out ours, so it will take more lifetimes in order to achieve the full knowledge of this machine that is everywhere. It is curious how small things can have so much control and can be so complex. Also, how there are cells specialized in different things, like neurons, stomach cells, blood cells, muscle cells, and skeletal cells. The cell is the basic unit of life. The human body is composed of trillions of cells. They provide structure for the body, take in nutrients from food and make those nutrients into energy. Cells also contain the body’s hereditary material and can make copies of themselves. I think it is interesting how something so small can be so complex. Cells are basically the most effective machines. They can carry out many different processes at the same time effectively. They can even do things that humans haven’t been able to do in years. The documentary that we saw in class showed me a whole new world that I had never seen or imagined. I think it’s amazing the fact that many organisms are made out of trillions of cells and that there is a huge variety of different cells and their functions. This class has been really eye-opening and it has made me more curious about studying animal biology in the future.